I’m a big fan of Babolat tennis and the classic, calm play of the grass court. The all white uniforms are so classic and have been for hundreds of years. Babolat brought technology to the game and now they bring crisp comfort to your court looks, that you can take anywhere and wear with confidence! 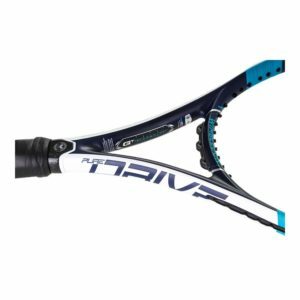 Babolat represents the turn of technology for tennis with the creation of strings one year after the lawn tennis was invented. Because players run in outdoor conditions ideal for grass, Babolat’s clothing features Watertrack Technology and Fiberdry, which guarantees high-performance moisture management during and after play. As well there’s UPF 50+ certified protection to keep you cool, fresh, and moving comfortably during the hottest days of summer. Want to see the men’s, boy’s, and girl’s Wimbledon collections? We’ve got those, too! If you want to give the courts a go during the Wimbledon Grand Slam tournament where the stars shine then you’re going to love this branded collection. Let’s start with the tank, perfectly suited for your hot summer at the club. The Wimbledon Performance Tennis Racerback packs functionality and class with a sleeveless design where a wide racerback meets at the back. Below there’s a looser fit that cascades to keep you comfortable, while the scoop neckline keeps your chest cool and unrestricted. The Wimbledon logo on the right of the chest adds the stamp of approval to your athletic wardrobe. With the blue Babolat logo on the left chest this tank should make you feel like a champion! My favorite top in this collection is the Women’s Wimbledon Core Tennis Tee. The contrast taping at the scoop neckline along with the modest coverage of gray cap sleeve makes you feel covered and feminine at the same time. The larger Wimbledon logo on the right hip adds a sweet touch of style as it shows off the enlarged details of the old racquets, the grips, and the tennis ball. An easy, casual look is great when this tee is paired with some white capris and sandals off court. During warm-ups, wherever you’ll be this summer, or in between sets, you’ll want to cover up with the Women’s Wimbledon Performance Tennis Jacket. The stand up collar, long sleeves, full zipper, and straight pocket create a slimming effect to flatter everybody. The hem at the sleeve keeps them in place so they won’t distract you on the court. The Babolat logo on the back allows you to represent your favorite brand subtly, (thank you, Babolat) and the contrast of gray is fashionable. Finally! My favorite sportswear item – the skort. The Wimbledon Performance Tennis Skort in White is chic and conservative with its pure white base and thick, wide waistband.. Wear it with the Wimbledon Performance Cap Sleeve Tennis Top for a competition-ready outfit. The straight skort with elastic waistband is comfortable and allows for complete range of motion during swinging and intense drills. Babolat logos on both sides of the skort are a wonderful contrast to the white with its distinct blue and gorgeous grays. The modest length and included ball shorts are perfect for Wimbledon-style dress code. 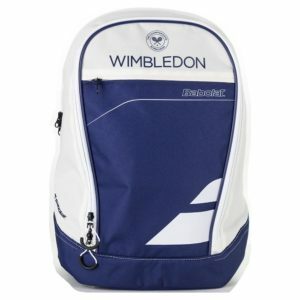 We at Tennis Express are excited to bring the aura of Wimbledon to our collections. 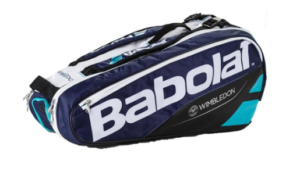 Babolat even included Wimbledon Tennis Bags and Backpacks that we have product reviews for as well on our YouTube channel! Start laying out what you’ll practice on grass in and be sure to share pics with our instagram @tennis_express! ← Wimbledon Wants: Top 10 Tennis Products for London!